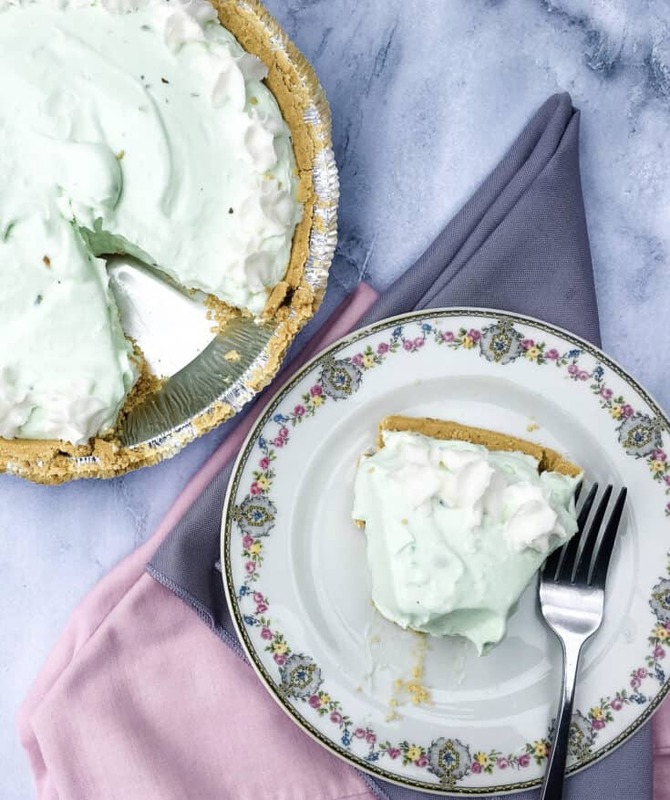 Pistachio cream pie is an easy no bake dessert made with pistachio pudding and a graham cracker crust, which makes for a cool and creamy treat! 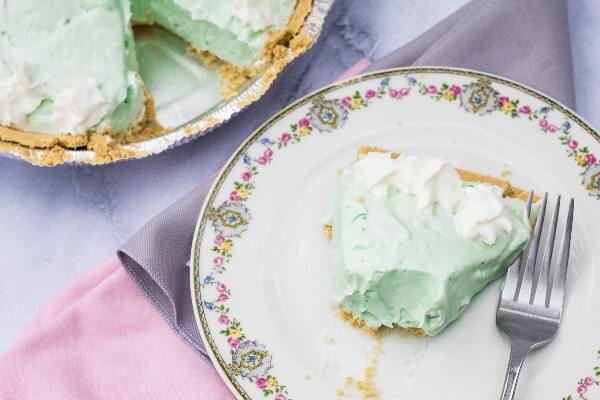 Perfect for spring and summer, you can bring this pistachio cream pie to a BBQ, potluck, or its pretty pale pastel green color is lovely for Easter or Mother’s Day! 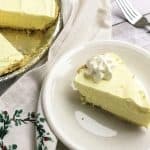 Creamy desserts are one of my family’s favorites! There’s something about the light and fluffy sweet cream paired with a slight bit of crunch from cookies or graham crackers that makes them so appealing! 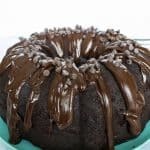 From heavenly chocolate Oreo cream layered dessert, to creamy peanut butter pie, to decadent speculoos tiramisu and more, no bake desserts are something the entire family enjoys. 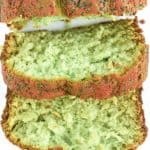 I recently made a batch of pistachio bread, but I had accidentally bought one extra box of pistachio pudding. 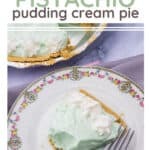 I decided to put that box to good use by making a pistachio pudding cream pie. Have you ever had pistachio ambrosia salad? Some people refer to it as Watergate salad. But it’s essentially some pistachio pudding with whipped cream, fruit, nuts, and marshmallows mixed it. It was always a staple at our church potlucks growing up, and that’s what initially inspired me to make a pie with the pistachio pudding mix. I opted not to use fruit, marshmallows, or extra nuts in the pie, just to keep things simple. But you could totally add those in if you wanted to! The resulting pie was light and fluffy, perfectly creamy, and a lovely pale shade of pastel green. In short–it was a success! 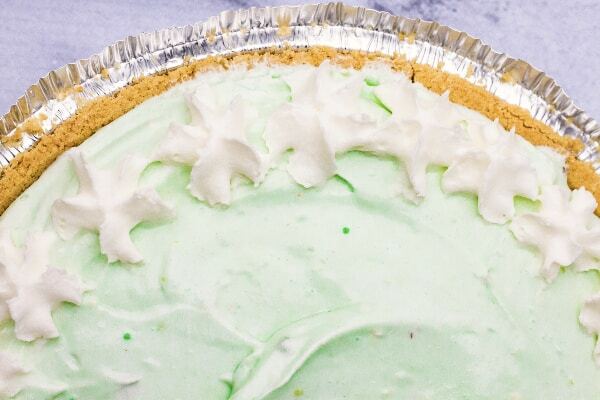 It’s so easy to make this pistachio cream pie! With a handful of ingredients, this pie comes together in a matter of minutes. Combine pudding mix and milk. You’ll start by mixing the pudding mix and cold milk for a couple of minutes. Combine cream cheese, butter, and powdered sugar. In another bowl, beat together some softened cream cheese, softened butter, and powdered sugar. This will form a thick frosting-like mixture. Mix together the pudding mixture with the cream cheese mixture, then fold in the whipped topping. Pour the filling into a graham cracker crust. Chill the pie for at least a few hours to allow it to set up a bit more. Serve and enjoy! The filling for this pie is supposed to be very creamy and soft. It does set up some in the refrigerator after chilling, but it does not set up to be super firm. We like it that way, but just know that if yours is still soft and creamy after chilling, that’s how it should be! 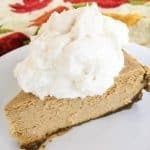 I used a store bought graham cracker crust, but you can always make your own if you prefer. 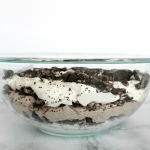 You could also use an Oreo crust! 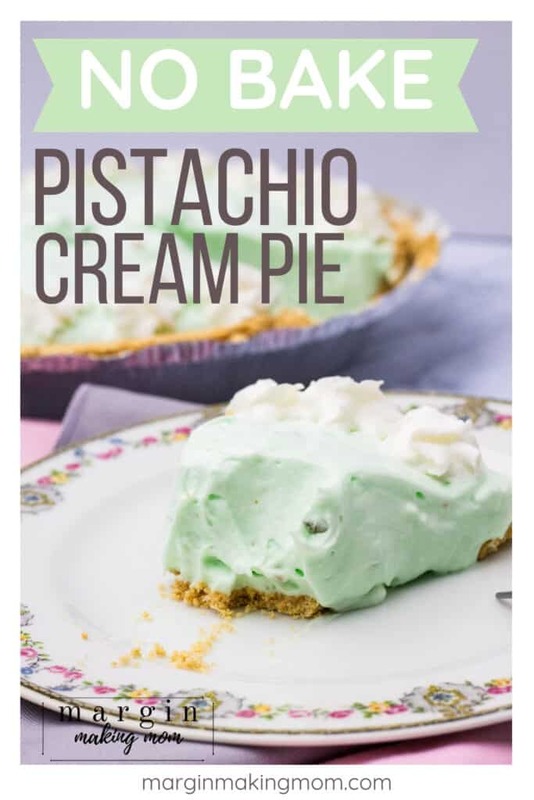 If you prefer to make this as a pistachio ambrosia pie, you can add in marshmallows, crushed pineapple, and extra nuts (such as chopped walnuts, pecans, or pistachios). In that case, I’d recommend using a 20-oz can of crushed pineapple. Gently mix the pineapple and its juice with the dry pudding mix (in lieu of milk) as well as the whipped topping. Once that’s combined, add in 1-2 cups of mini marshmallows and 1/2-1 cup of chopped nuts, depending on how chunky you want the filling to be. Pistachio cream pie is an easy no bake dessert made with pistachio pudding and a graham cracker crust. 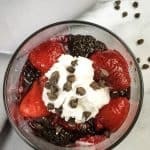 It makes for a cool and creamy treat, perfect for spring and summer! In a large mixing bowl, mix together pudding mix and cold milk at low speed for 2 minutes, until it begins to thicken slightly. 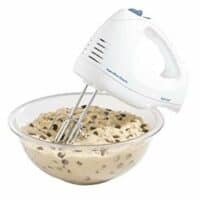 In a small mixing bowl, use an electric mixer to beat together cream cheese, butter, and powdered sugar until it is the consistency of thick frosting. Add cream cheese mixture to the pudding mixture and beat together on medium-high speed until smooth. Gently fold in (or mix on low speed) the whipped topping, until the mixture is uniformly pale green with no white streaks. Pour filling into prepared pie crust. Allow to chill for at least 2 hours before serving. The filling for this pie is supposed to be very creamy and soft. It does set up some in the refrigerator after chilling, but it does not set up to be super firm. We like it that way, but just know that if yours is still soft and creamy after chilling, that's how it should be! 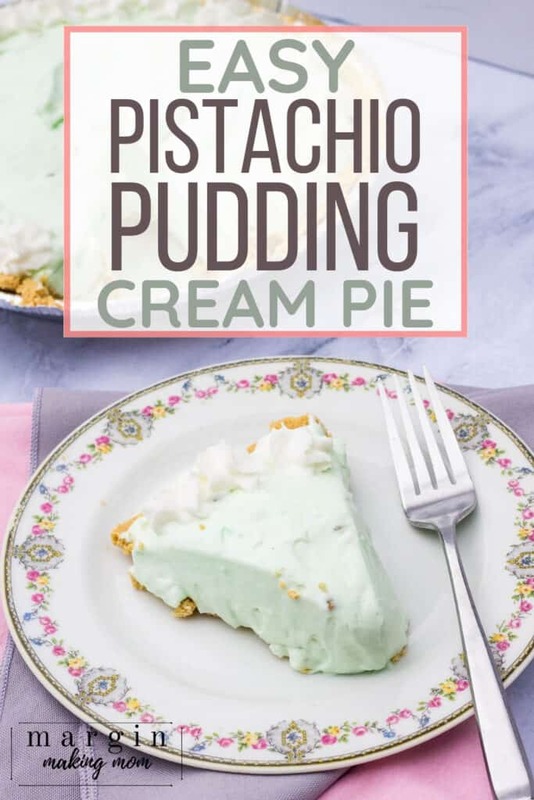 If you prefer to make this as a pistachio ambrosia pie, you can add in marshmallows, crushed pineapple, and extra nuts (such as chopped walnuts, pecans, or pistachios). In that case, I'd recommend using a 20-oz can of crushed pineapple. Gently mix the pineapple and its juice with the dry pudding mix (in lieu of milk) as well as the whipped topping. Once that's combined, add in 1-2 cups of mini marshmallows and 1/2-1 cup of chopped nuts, depending on how chunky you want the filling to be. Did you make it and love it? I appreciate your 5-star review! I love seeing my recipes come to life "in the wild." Snap a photo and tag me on Instagram @marginmakingmom or use #marginmakingmom so I can see your creation!